Facing intense pressure from new entrants like Amazon, a $10B midwestern grocer came to NorthOut to roadmap a 5-10 year digital strategy. As one of our nation’s largest expenditures, grocery presented a unique opportunity to leverage NorthOut’s frontier technology and artificial intelligence skill sets. Their CEO needed a board-level innovation roadmap, so our product & design team got to work. 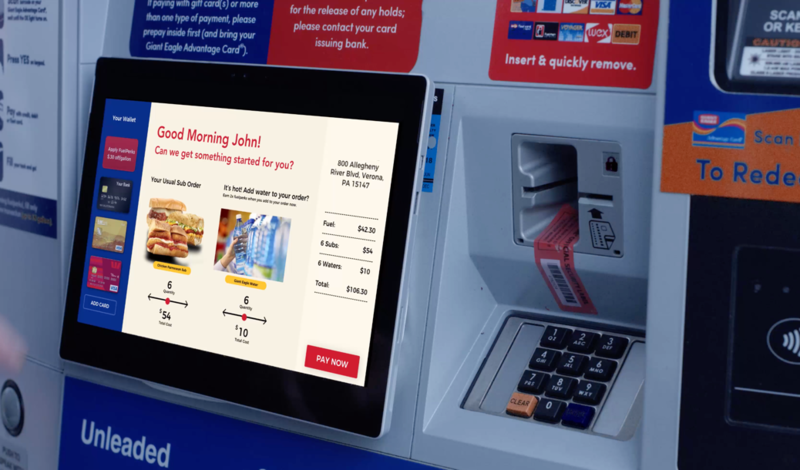 Our design, video, and product teams created an 8 minute visualization video demonstrating in real life how the future of grocery could look. Across 23 different experiences, we showed the board and 36,000 employees that the competition had a fight ahead of them. Beyond the video, we fully designed and documented each experience in a multiyear roadmap to enable future investment. We then kicked off building a few of the products as Proof of Concepts. A Data Lake Vision and Chatbot. The two key experiences in the video, a chatbot-enabled service platform and an improved data lake, kicked off as full projects. Within weeks our teams had gotten rolling and were driving forward. When faced with competitive pressure, no one goes to bat quite like NorthOut. Our deliverables are practically never your typical consulting firm powerpoints. We put engineering and design first to create things teams could see, share, and that drive emotion. That’s just how we roll. In a data rich, high-frequency industry like grocery, our unique infusion of data science across NorthOut provided insights a typical firm could not. Beyond our own experience, we helped inspire data’s importance across the company. Our workshop-based approach helped seed AI and data ideas even outside of the core project team. Throughout our sprints, varied executives and team members joined to share problems, ideas, and brainstorms. Retail grocery is facing accelerated transformation across the customer journey. Personalization, improved service and digitally integrated experiences are key to taking the lead. From an employee engagement app, to machine vision nutritional advice, to Google Home and far beyond, we demonstrated not just what do build but how it would interact with real customers. Video is the ideal way to align corporate vision and voice. With the highest quality greenscreen experiences and production, video is the way to show your team the future. Grocery and retail in general is facing increased pressure to win with digital. Our team can go from roadmap to enterprise-wide engineering cemented in fresh perspectives.